Caterpillar dropped 3.5 percent, the most in the Dow. Caterpillar and other industrial companies rely heavily on overseas sales and could suffer if commerce is curtailed by rising trade barriers. The latest market swing came after President Donald Trump proposed tariffs on an additional $100 billion in Chinese goods. The Dow recovered some of its worse losses to end down 2.3 percent at 23,932. The S&P 500 fell 58 points, or 2.2 percent, to 2,604. The Nasdaq composite dropped 161 points, or 2.3 percent, to 6,915. Stocks are falling sharply again as trade tensions heat up between the U.S. and China. 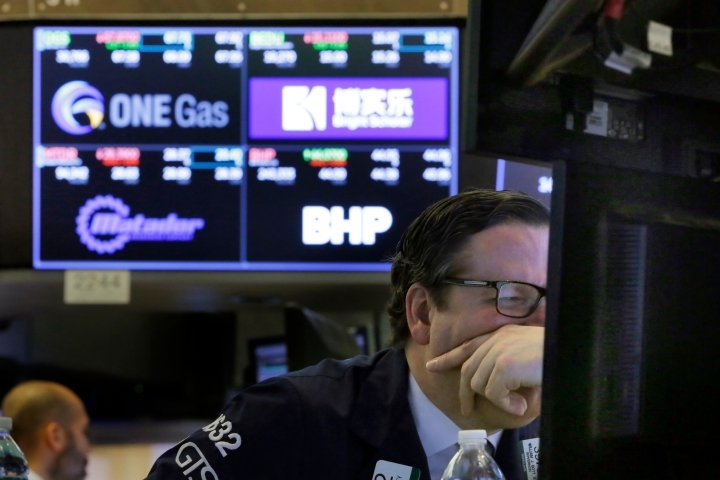 The Dow Jones industrial average fell as much as 620 points in afternoon trading Friday, its latest big swing this week. Aerospace giant Boeing fell the most in the Dow, dropping 3.4 percent. Boeing and other industrial companies rely heavily on overseas sales and could suffer greatly if global commerce is curtailed by rising trade barriers. Technology companies and banks also fell. Apple lost 2 percent and JPMorgan Chase gave up 2.9 percent. The Dow fell 588 points, or 2.4 percent, at 23,909. The S&P 500 fell 56 points, or 2.1 percent, to 2,607. The Nasdaq composite dropped 139 points, or 2 percent, to 6,937. Stocks are falling again as trade tensions heat up between the U.S. and China. Technology companies, banks and industrial stocks were falling the most in midday trading Friday. Apple lost 1.4 percent and Boeing fell 2.6 percent. The market has been on a bumpy ride this week as traders try to get a sense of whether a trade dispute between the two nations will escalate. President Donald Trump has proposed more tariffs on Chinese goods. The S&P 500 fell 27 points, or 1 percent, to 2,635. The index is now down for the week. The Dow Jones industrial average lost 346 points, or 1.4 percent, to 24,158. The Nasdaq composite declined 59 points, or 0.9 percent, to 7,016. The yield on the 10-year Treasury fell to 2.78 percent. Stocks are opening lower after President Donald Trump proposed more tariffs on Chinese goods. Industrial companies were especially hard hit by the escalation in trade tensions Friday. Aerospace giant Boeing fell 1.1 percent. There wasn't much for investors to like in the government's latest jobs report either. Employers added 103,000 jobs last month, the weakest showing in months, and January and February's numbers were also revised lower. The S&P 500 fell 11 points, or 0.4 percent, to 2,651. The Dow Jones industrial average lost 152 points, or 0.6 percent, to 24,347. The Nasdaq composite declined 20 points, or 0.3 percent, to 7,056. Bond prices rose. The yield on the 10-year Treasury note fell to 2.80 percent.